I've been advised to start a topic here, as i'm having multiple issues. There are 6128 more sites. MSCONFIG\startupreg: GarminExpressTrayApp => "C:\Program Files\Garmin\Express Tray\ExpressTray.exe"
MSCONFIG\startupreg: iTunesHelper => "C:\Program Files\iTunes\iTunesHelper.exe"
MSCONFIG\startupreg: SandboxieControl => "C:\Program Files\Sandboxie\SbieCtrl.exe"
MSCONFIG\startupreg: Spotify Web Helper => "C:\Users\Davina-Divine\AppData\Roaming\Spotify\SpotifyWebHelper.exe"
MSCONFIG\startupreg: SunJavaUpdateSched => "C:\Program Files\Common Files\Java\Java Update\jusched.exe"
Check "winmgmt" service or repair WMI. Could not list Devices. Check "winmgmt" service or repair WMI. Description: Product: Kaspersky Internet Security - Update 'KIS 2016 MP1 family (Patch j)' could not be installed. Error code 1603. Additional information is available in the log file C:\Windows\TEMP\MSI2064e.LOG. Description: Product: Kaspersky Internet Security - Update 'KIS 2016 MP1 family (Patch j)' could not be installed. Error code 1603. Additional information is available in the log file C:\Windows\TEMP\MSI2064d.LOG. Description: Product: Kaspersky Internet Security - Update 'KIS 2016 MP1 family (Patch j)' could not be installed. Error code 1603. Additional information is available in the log file C:\Windows\TEMP\MSI2064c.LOG. Description: Product: Kaspersky Internet Security - Update 'KIS 2016 MP1 family (Patch j)' could not be installed. Error code 1603. Additional information is available in the log file C:\Windows\TEMP\MSI2064b.LOG. Description: Product: Kaspersky Internet Security - Update 'KIS 2016 MP1 family (Patch j)' could not be installed. Error code 1603. Additional information is available in the log file C:\Windows\TEMP\MSI2064a.LOG. Description: Product: Kaspersky Internet Security - Update 'KIS 2016 MP1 family (Patch j)' could not be installed. Error code 1603. Additional information is available in the log file C:\Windows\TEMP\MSI20649.LOG. Description: Product: Kaspersky Internet Security - Update 'KIS 2016 MP1 family (Patch j)' could not be installed. Error code 1603. Additional information is available in the log file C:\Windows\TEMP\MSI20648.LOG. Description: Product: Kaspersky Internet Security - Update 'KIS 2016 MP1 family (Patch j)' could not be installed. Error code 1603. Additional information is available in the log file C:\Windows\TEMP\MSI20647.LOG. The account specified for this service is different from the account specified for other services running in the same process. Windows Defender scan has been stopped before completion. Windows Defender has encountered an error trying to load signatures and will attempt reverting back to a known-good set of signatures. Error description:The system cannot find the file specified. Windows Defender has encountered an error trying to update signatures. Hello and welcome to GeekPolice.Net My name is Dave. I will be helping you out with your particular problem on your computer. While I'm checking over your logs please run these scans. You may have to run MBAM in Safe Mode. Before starting AdwCleaner, close all open programs and internet browsers, then double-click on the AdwCleaner icon. When the AdwCleaner program will open, click on the Scan button as shown below. AdwCleaner will now start to search for malicious files that may be installed on your computer. To remove the files that were detected in the previous step, please click on the Clean button. AdwCleaner will now prompt you to save any open files or data as the program will need to reboot the computer. Please do so and then click on the OK button. AdwCleaner will now delete all detected adware from your computer. When it is done it will display an alert that explains what PUPs (Potentially Unwanted Programs) and Adware are. Please read through this information and then press the OK button. You will now be presented with an alert that states AdwCleaner needs to reboot your computer. Please click on the OK button to allow AdwCleaner reboot your computer.A log will be produced. Please copy and paste this log in your next reply. 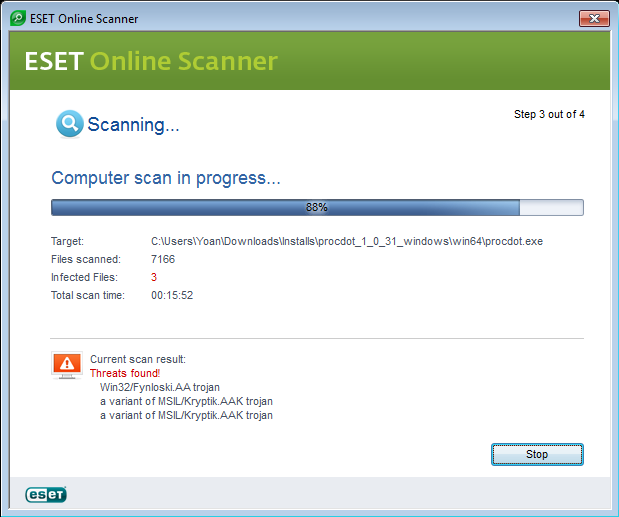 Download and install: Please download Malwarebytes' scanner to your desktop. It should update automatically if the computer is connected to the internet. Click on Threat Scan and click on Scan Now. When the scan is complete make sure all the infections have "quarantine" selected in the Action box. Click on "Apply actions" You may be asked to Restart your computer to completely remove the infections. When disinfection is completed you can click on "Copy to Clipboard". Internet Explorer's security is based upon a set of zones. Each zone has different security in terms of what scripts and applications can be run from a site that is in that zone. There is a security zone called the Trusted Zone. This zone has the lowest security and allows scripts and applications from sites in this zone to run without your knowledge. It is therefore a popular setting for malware sites to use so that future infections can be easily done on your computer without your knowledge as these sites will be in the Trusted Zone. Therefore, I recommend that nothing be allowed in the trusted zone. If you agree, please do the following. •From within Internet Explorer click on the Tools menu and then click on Options. •Click once on the Internet icon so it becomes highlighted. •Click once on the Custom Level button. * Change the Security level to High. •If it prompts you as to whether or not you want to save the settings, press the Yes button. •Next press the Apply button and then the OK to exit the Internet Properties page. No malicious Firefox entries deleted. Trying to load Malwarebytes, I get the message cannot connect to service, I also can't start this in services. You mentioned about internet explorer, but I only ever user Chrome really, unless it's being really lagish, then I use firefox, but I can't seem to get rid of internet explorer. Would this still cause a problem even if I don't use it? “Trying to load Malwarebytes, I get the message cannot connect to service, I also can't start this in services. No, if you don't use it. Forget about MBAM for the moment and run the other scan. Windows Security Center service is not running! This report may not be accurate! Java version 32-bit out of Date! Looking over your log it seems you don't have any antivirus software. Before we continue download and install a free antivirus. Remember to only install one antivirus! 4) MicroSoft Security Essentials All versions and all languages. It is strongly recommended that you run only one antivirus program at a time. Having more than one antivirus program active in memory uses additional resources and can result in program conflicts and false virus alerts. If you choose to install more than one antivirus program on your computer, then only one of them should be active in memory at a time. I highly recommend MSE for your AV. You should also start your Windows Security Center. Spybot and SuperAntispyware are obsolete scanners. 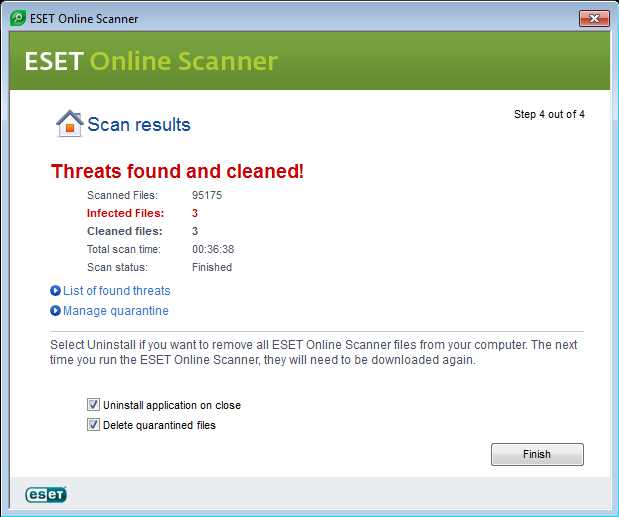 Note : If you use Internet Explorer to get the ESET Online Scanner, you won't have to download, nor install the tool, as everything will be ran in a contextual (pop-up) window of Internet Explorer. 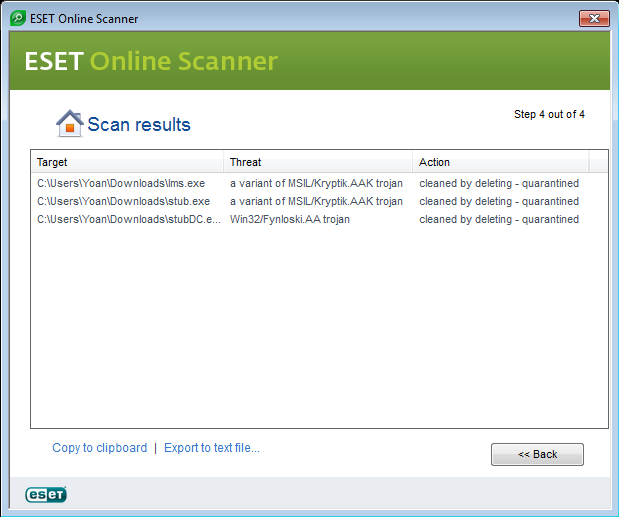 However, for every other browsers, you will have to download and install ESET Online Scanner. In this set of instruction, I'll use Google Chrome to download it and run it (since a lot of people will do it), however, except for the download and installation procedure, the same instructions applies if you use Internet Explorer. Please note that two or three prompts will appear if you use Internet Explorer asking you to reload the page, authorize the application, execute it, etc. 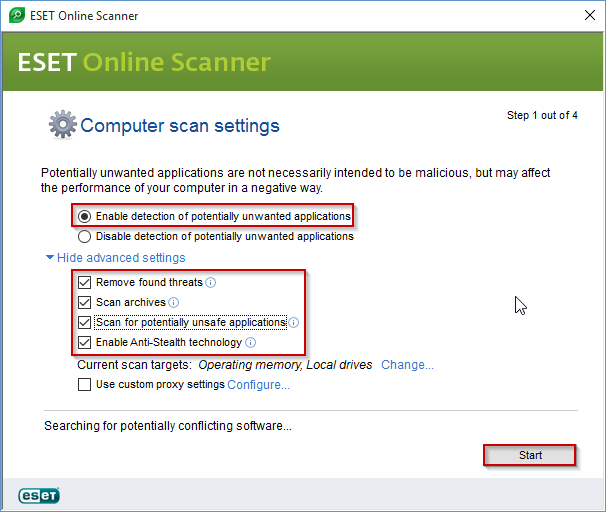 Accept all of them in order to run ESET Online Scanner. I do Kaspersky installed, I have for some time. Strange it doesn't show up. 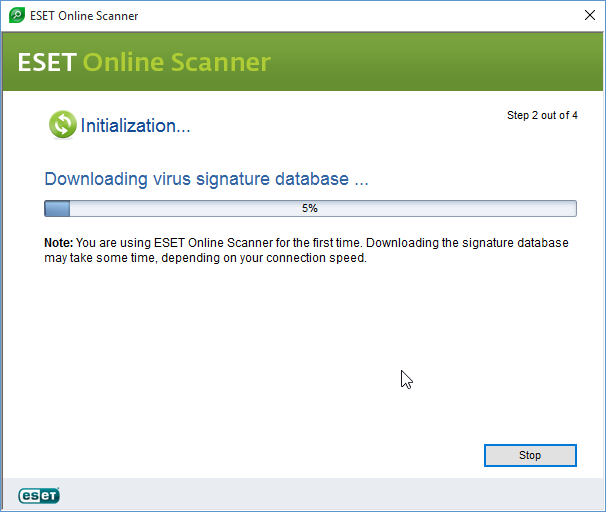 I'll do the eset online scan now. Please give me an update about your computer? There's no change im afraid. Please explain what happens when you try to install a program.